These cuts in the asphalt are one sign that DDC is about to dig up West Street to install a two-way protected bike lane. 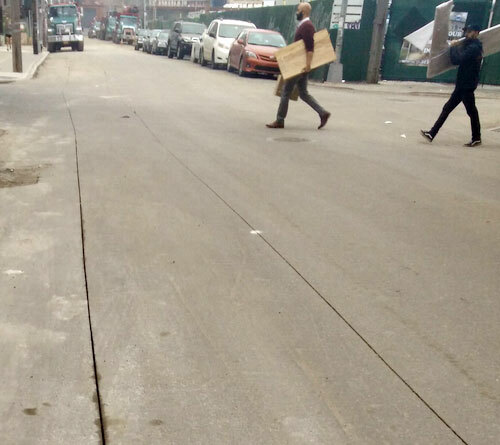 More than three years after it was approved by Brooklyn Community Board 1’s transportation committee, construction on the West Street segment of the Brooklyn Waterfront Greenway is finally underway. The Department of Design and Construction confirmed that current work on West Street is related to the greenway. The project will turn West Street into a one-way northbound route for cars with a two-way protected bike lane on the west side of the street. The redesign from Quay Street to Eagle Street is part of the 14-mile Brooklyn Waterfront Greenway that will stretch from Sunset Park to Greenpoint. West Street will be entirely reconstructed from top to bottom. In addition to the bikeway, DDC will construct bioswales and high-level sewers to prevent stormwater from overloading the system and sending raw sewage into the city’s waterways. The current construction work also includes the replacement of “century old watermains on Calyer Street from Franklin Street to West Street,” according to DDC. 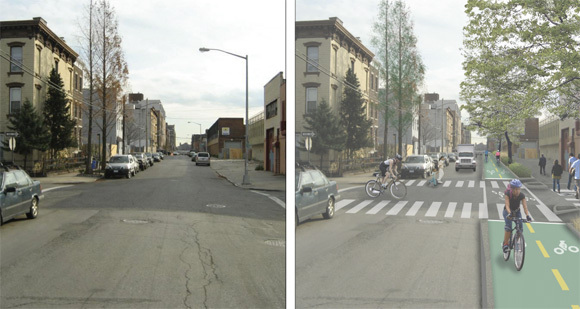 That truck has been shrunk for the rendering by DDC. Why isn’t it green across the junction? That’s the most important spot for it to be green! It’s probably moot given that the green would wear off in less than a year with the low quality street work which sadly has become the norm. Why can’t NYC just make the bike lanes colored concrete? Or even uncolored concrete? Either way it would be clearly differentiated from the rest of the street. It would also provide a much longer lasting surface which can’t get potholes. Just make sure to locate the utilities on the other side of the street so Con Ed never, ever needs to break up the bike lane. And use reinforced concrete. With only bikes riding over it, it’ll easily last a few centuries. That sounds like a great way to delay implementation for a couple decades. They’re already doing a full Street reconstruction in this case. I’d recommend pigmented asphalt in general. I have no idea if anyone in New York has looked into the marginal increase in cost for using it. Pigmented asphalt over a concrete base would give the best of all worlds—differentiation, a smooth surface, freedom from potholes, and long life. Of course, this being NYC we won’t do it since we’re penny wise but dollar foolish.